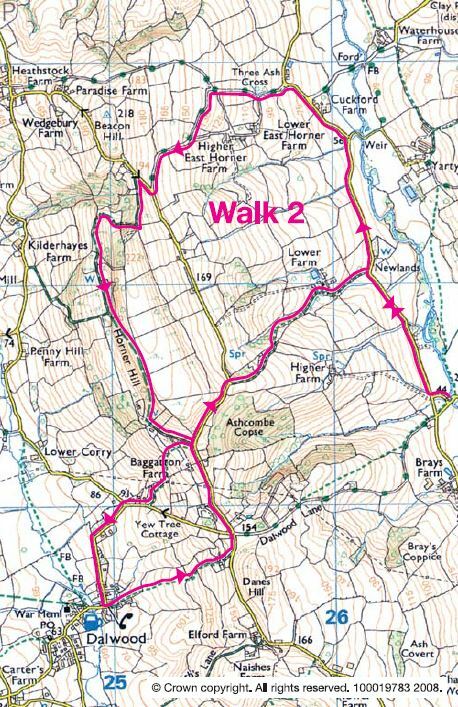 This walk, on the easterly side of the parish close to Dalwood village, takes a circular route on paths and country lanes. Stroll through the turbary on Horner Hill to enjoy resplendent views of the Corry Valley and beyond to the Channel at Axmouth. There is also a chance to visit Beckford Bridge on the River Yarty — a packhorse bridge long used by travellers and livestock before the days of vehicles. Some flat sections but some fairly steep ascents and descents — some sections can be muddy.